Mint.com provides a free service, which is able with your authorization, to connect to your bank(s), retrieve your bank account information and all your transactions and provide value-add services with the data. In particular, it allows you to see where you money is spent and give you hints at how you could save money. I personally think it is a superbly designed UI to the user data held at banks, which shows how much value there is to unlock, and also how much startups can be so much more efficient at delivering innovating services than banks themselves sometimes. Yodlee, a partner of Mint.com, was a dot com era example of this and Mint.com might be their Web 2.0 equivalent. One problem is: Mint.com requires you to provide your actual username and password to the online banking service provided by your bank, which you use not just to view transactions, but also to make payments, transfers, etc.This approach has several drawbacks. One is that the user can be legitimately concerned about what would happen if this information would get compromised. Right now, Mint.com reassures its customers by saying: “We don’t store your info, Yodlee does”. Not very convenient. Add to this the fact that you can’t have any guarantee of what happens to your username/password when you want to terminate your relationship with Mint.com/Yodlee, and you may feel like you won’t use this application for now. An implementation of OAuth protocol between Yodlee/Mint.com, the user and the bank can solve these problems at once, and would certainly further drive user adoption. OAuth is self-described as a protocol for “secure API authentication”, but a better way to put it is that OAuth is a way for users to grant controlled access to their data hosted at online service A to another online service B. To use the car metaphor, if your data at online service A was a car, and online service B was the valet parking person, OAuth would be the way for the valet parking person to ask you for your car’s valet key, with which he can only drive a few miles and can’t open the trunk, and the way for you to give him the key. In security jargon, OAuth allows to delegate capabilities on your data to other applications, in the form of signed tokens, i.e. authorizations to do specific things with specific data that you sign with your identity. The beauty of it is: because these capabilities are signed by you, it can be presented by online service B to access your data at online service A without you having to provide your identity credentials (username/password typically) to online service B. The user would go to Mint.com to request access to his data at the bank. Upon receiving this request token, Mint.com would redirect the user to the bank’s token authorization page. Mint.com can then substitutes the request token with the access token, and access the user’s data as they requested and as the user authorized, until the token is invalidated or expires. 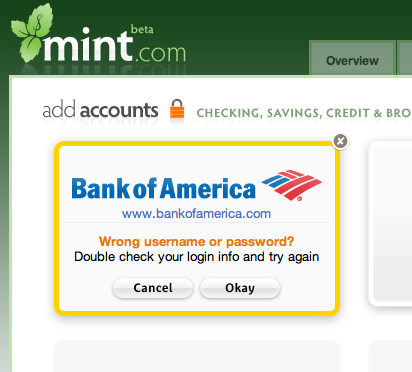 Mint.com/Yodlee never know the username/password used to log in at the bank. When the user decides to terminate the relationship with Mint.com/Yodlee, he knows they don’t have is username/password and he knows that they can’t access his data anymore. The big question is: how much work would be involved at banks and Yodlee to support OAuth, and in particular, what would they have to change? Decentralized social networks seem to be the talk of the town these days (in tech circles at least). Blogger Robert Scoble has given attention and created a minor scandal of a Facebook policy that forbids the use of scripts to extract data from Facebook Web pages (Note: Facebook just recently allowed accounts to be closed). Around the same time project DiSo has started with the goal to build a decentralized version of Facebook based on the open source WordPress personal publishing platform, and workgroup DataPortability.org has kicked off to define best practices to make personal data easily movable, reusable, remixable, etc. across Web services. Just two days ago at his Northern Voice 2008 keynote, Matt Mullenweg, creator of WordPress, seemed to be almost hinting at what his company was up to with their recent $29.5M round of funding: a better, open-source alternative to closed social systems like Facebook that would use social filters to bring more relevant content. As I mentioned in my previous post on business platforms of Web companies, one key aspect of these business platforms is that “they retain control over who gets to see the information and how”. Having a point of mediation is an essential part of online capitalism. Without it, there is no point of value extraction and no big business. The natural question then is: if so many techies are excited about the inevitable advent of decentralized and portable social networks and related personal data, and if that means essentially that there is little point of control anymore for these Websites, how are businesses going to make big money out of this? Relevancy services: This is would be an expansion of services such as Akismet, WordPress’ spam filtering service, which is currently free for personal use. Matt insisted strongly in his keynote how content relevancy (i.e. no spam) is really what users value, and how spam from bad users is what kills social systems. Perhaps a high-quality filtering system that would combine the Akismet filter and a social filter (a filter based on your social graph) is something people would be ready to pay for. The ring tone business model. This model consists in deriving transaction fees from digital goods sold on WordPress.com, such as themes and widgets. Because WordPress.com knows which blogs use which themes and widgets, this would be easily done there. It may be a bit harder for users of the WordPress open source software itself. This would be the equivalent of the ringtone business. Matt Mullenweg revealed himself that “People want their online presence to be an expression of themselves and in that regards, being able to customize the design is critical”. Matt even compared a blog as a locker, which are typically heavily personalized. This list does not mean to be exhaustive, but seeks only to start a discussion on a subject that is getting more and more relevant. I would be curious to see what others think. 24C3 is the 24th Chaos Communication Congress, a 4-day conference I got to know reading this post at the always awesome We make money not art. All sessions were videotaped and are available to download. I absolutely recommend the presentation given by Drew Endy on DNA programming. In a nutshell, Drew views DNA as an evolved program in some poorly documented machine language and shares his experience reverse-engineering this program, synthesizing DNA and uploading it to a cell i.e. “hacking biology”. The session Paparazzi – The free autopilot is about how anyone can build a cheap version of the $1M UAV/drones monitoring everyone of us 24/7. Quite interesting for anyone with an interest in aviation. The cool thing is that the drone is literally remotely controlled via an open source software you can find here. You can assign a flight plan to the drone and it will follow it. The platform is packed with sensors that allow remote control and capture of data (videos, pictures). I hope these guys talk with the OpenStreetMap people: how could would it be to use this platform to capture views from the sky at a much higher resolution than satellites can provide. This last point particularly resonated with me since I’m a big believer of decentralized social networks. I’m curious to see how a promising project like the DiSo project will resolve this chicken/egg problem: to finance a decentralized system, you need accumulated wealth, but to attract accumulated wealth you need a point of mediation where you can extract value, which you don’t have in a decentralized system. One way may simply be some form of public funding. After all, if we didn’t have ARPA, we would probably all be surfing AOLNet or MSNNet these days. Anyway, this conference is clearly politically incorrect in many ways but is awesome and I recommend everyone to watch some of these sessions!